Sport, one of Harriet M. Welch’s best friends, lives with his dad ,who is an excellent parent, though he is not wealthy or sophisticated like Sport’s mother. Early in the story, Sport’s grandfather passes away, leaving Sport a significant sum of money. This prompts his mother to become suddenly interested in her son’s well-being and she begins trying to gain custody of Sport in place of his dad. When she doesn’t get her way right off the bat, Sport finds himself kidnapped! I had some reservations when I first decided to read Sport, because I knew it had been rejected by Louise Fitzhugh’s publisher in her lifetime, and was only published later on, after she died. (The full story on that is written up very nicely here, on a blog called Harriet the Spy: the Unauthorized Biography.) 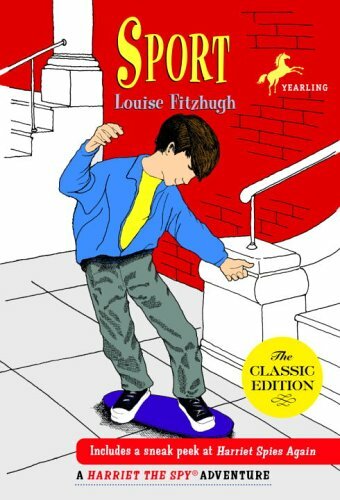 Still, I was curious about the differences between Sport and the two titles that were so well-received while Fitzhugh was alive - Harriet the Spy and The Long Secret. I have to say, I’m glad I took the chance, because of the three, this wound up being my favorite. First and foremost, I found this book much easier to read than the other two. One of my frustrations with both Harriet the Spy and The Long Secret is the sophistication of the language, mostly because it distracts me from everything else about the stories. I could never get immersed in characters or plot in those earlier books because the language seemed to call so much attention to itself. This does not happen in Sport. Rather, this story feels like it comes from the point of view of a child, and even the atmosphere of New York City and the issues Sport has with his parents feel more relatable and contemporary. The second thing I noticed about this book was that I actually felt some connection to Sport. I didn’t feel much of anything for Harriet or Mouse, but Sport got into my head and stayed there for a while. His struggles with adults and his confusion with sorting out the good adults from the bad ones are universal experiences, and I felt real sympathy for him as he went through those situations. I also liked seeing the diversity of his friends, and how cartoonish Harriet seems among them. In his own story, Sport becomes much more than the boy who doesn’t understand how to play town. I do recognize, of course, that girls have loved Harriet and The Long Secret for at least three generations now, and I want to say that of course those books have merit. I just think they’re for a certain type of reader in a certain type of mood. Sport, on the other hand, is an easier read, more likely to interest boys, and focuses on issues kids still face today - perhaps even more than they did in the 1960s or 70s. Sport is a great read-alike for books by E.L. Konigsburg and Madeleine L’Engle, who also tackle important real-life issues often against a New York City backdrop. The Young Unicorns picks up not long after the ending of The Moon By Night. The Austins are now living in New York City, where they have befriended Emily Gregory, a young blind pianist, and Josiah “Dave” Davidson, a former gang member who now helps Emily with her reading for school. Early in the story, these characters cross paths with Canon Tallis, the mysterious priest who first appears in The Arm of the Starfish. This meeting is the first in a long series of events that put the innocent Austins and others whom they care for in grave danger. There is so much happening in this book, I find it almost impossible to summarize it. Part of the story is related to Mr. Austin’s work with the Micro-Ray, a technology so powerful it can easily be misused if it falls into the wrong hands. Another thread of the plot involves the Alphabats, the gang of which Dave used to be a member, who wreak havoc on the streets of Manhattan and continually try to bring Dave back into their fold. Yet another storyline involves the corruption of a priest associated with the cathedral where Rob and Dave have both found such solace. I spent much of the book in total confusion, trying to put the pieces together to make a complete picture. I’m still not sure I quite understand everything that happened, but that doesn’t mean I didn’t enjoy the book. I love the Austins, and this book gives a different perspective on their family dynamics than the other books have shown so far. We see the Austins at more of a distance in this book, and from the points of view of outsiders. For the first time, now that they live in the city, the Austins are portrayed as innocent, naive and highly susceptible to the dangers of the outside world. The reader questions whether their closeness and openness with one another is normal or healthy, and worries greatly for their safety. Even Mr. Austin, who seems like such a strong, protective character in The Moon by Night, suddenly seems weak in the face of great evil. I also liked seeing the Austins' reactions as members of the family begin to pull in different directions, even deceiving each other and sneaking out of the house. I tend to read more for character than plot, so in such a plot-driven book, it was nice to have these nice moments of insight into the characters, too. My other favorite thing about this book is its mood. L'Engle evokes feelings of uncertainty and foreboding in her descriptions of the New York City streets, overrun by drugs and gangs. She also does a lovely job of capturing the awe-inspiring beauty of the cathedral as well as the fear it evokes when such sinister activities take place within its walls. The Alphabats aren't the most believable gang in the world, but even so, L'Engle made me afraid of them by painting such a bleak and disconcerting picture of 1960s New York City. I'm not sure the end of the story is a great pay-off for all this suspense and intrigue, but it's all still beautifully written up until that point. 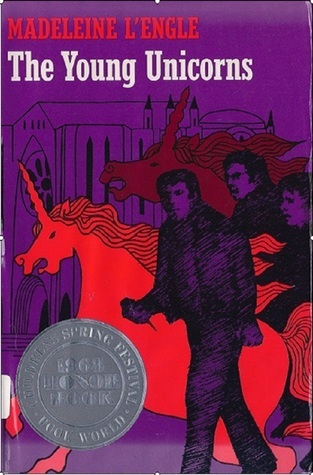 Above all, I suppose the main message the reader is meant to take away from The Young Unicorns is revealed in the quotation which inspired the title. It is printed on its own page at the front of the book and refers to “the unicorn, wild and uncommitted, which creature cannot be caught by the hunter, no matter how skillful.” It tells us that the unicorn “can be tamed only of his own free will.” I’m sure there is a way to apply this idea to every character in the story, but it seems to pertain the most to Dave, whose free will is what eventually separated him from the Alphabats, and to the Micro-Ray, whose dangers can’t be contained unless the people in command of it wish to use it safely and protect it. I’m glad to to have this strange, complex, and frustrating book behind me. I wish my review had more to say, but I just didn't connect as strongly with this book as with the previous Austin titles. I am, however, really looking forward to the next book on my O’Keefe / Austin list - A Wind in the Door.